My clients’ criminal case outcome can be improved by following the written action plan that I develop with them at our first meeting. My role with that action plan is to develop and pursue the best defense, in partnership with my client. My clients’ role in that regard is to take the proactive “homework” steps that I advise my clients, which includes alcohol education classes for DWI cases, clean urine testing for drug cases, community service and a theft class for theft cases, and anger management for assault cases, as more fully detailed here. 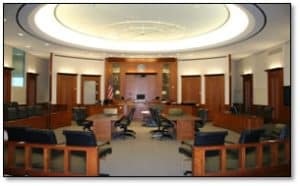 – Recently, my client who got convicted in General District Court for DWI appeared in Circuit Court with me on the day of his de novo trial on appeal from District Court. His alleged breath test result at the jail was 0.14, which exceeded the legal limit by 0.06. In this Virginia jurisdiction, it is uncommon. absent unusual circumstances, to be able to negotiate down to a reckless driving conviction from such a high breath score. Nonetheless, even though the prosecutor had his necessary witness present in court to make his case, my client and I beat the odds, reaching a wet reckless guilty plea, with no active jail time (my client got suspended jail and probation) and terms and conditions stricter than a typical wet reckless but well worth it. During the in-depth negotiations, I was able to tout to the prosecutor that my client already had completed VASAP, completed a Virginia DMV-approved driver improvement class, and completed many Alcoholics Anonymous meetings. Here as in numerous other situations, appealing the District Court conviction resulted in a better criminal case outcome in Circuit Court. With this particular client, we did not reach this great wet reckless driving result without first appearing in Circuit Court for two trial dates and proceeding before the trial date with a hard-fought evidence suppression hearing. – Recently, I went with my client to Virginia General District Court for my client charged with DWI and refusal to take the breath alcohol test. The discovery and video showed a real chance of being convicted of both counts at trial. In this jurisdiction, it is common for prosecutors not to offer better in negotiations than pleading to DWI and dismissing refusal for such charges under such discovery circumstances. My client went out of his way to get me documentation showing he had begun doing the homework assignments I recommended. During negotiations, I advised the prosecutor of my client’s homework progress, and informed the prosecutor that I was ready at trial to point out the late hour of the incident and likelihood that my client was exhausted at the time of the police encounter, rather than that alcohol caused his driving and physical behavior. We resolved the case for a criminal case outcome of a standard wet reckless driving disposition, with a dismissal of the refusal charge. This was a great day. – Recently, I went with my client to Virginia General District Court for his charge of misdemeanor shoplifting, under $200 value, from a major retailer. Often retailers are not willing to agree to recommend that the court dismiss charges under Virginia’s satisfaction and discharge law. Virginia’s satisfaction and discharge law generally provides that for misdemeanors with an alleged civilian victim, the alleged victim has the option to ask the court to dismiss the prosecution — bypassing the prosecutor in the process — by acknowledging “in writing that he has received satisfaction for the injury…” Va. Code § 19.2-151. On the trial date, I spoke with the witness from the store, and informed him that my client already had completed scores of documented voluntary community service hours, completed the official Virginia S.T.O.P. shoplifting class, and obtained a positive prognosis report from a local psychologist. The store witness not only then agreed to a satisfaction and discharge dismissal for payment for the value of the allegedly stolen merchandise, but the prosecutor agreed as a result simply to enter the case nolle prosequi/ dismissed as the criminal case outcome, which removed our needing to argue to the judge to effectuate the satisfaction and discharge agreement. – Awhile ago, my client got caught red-handed making several hand-to-hand illegal felony drug sales to an undercover police officer. With no real trial defenses, my client entered a guilty plea to three of those sales. Along the way before and after entering that guilty plea, my client performed scores of community service hours, obtained weekly clean urine drug tests, and successfully completed drug education. The outcome at sentencing — after informing the judge of such spectacular progress with my client’s homework assignments, among other arguments — was for the judge to impose a suspended jail sentence when the bottom of the voluntary sentencing guidelines called for at least several months incarceration. The bottom line here is that no matter how much sh*t a criminal defendant might think s/he is in with his or her criminal case, the defendant has no choice other than to obtain a qualified lawyer and to work hard and smart with that lawyer in pursuing the best possible result in the case, whether that result be obtained through trial (trial-readiness at all times is essential), case negotiations, or sentencing.